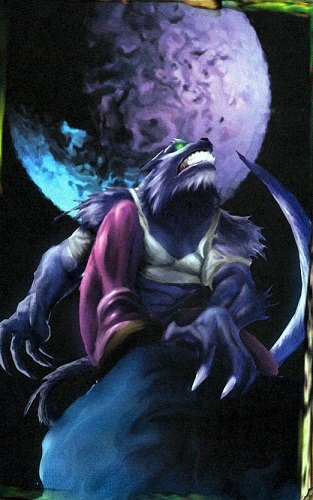 Powers/Abilities: As a werewolf, Jack Russell transformed into a wolf/human hybrid form at night. History: (Marvel Knights Millennial Visions 2001 - "Soldier by Day" (fb)) - A military soldier, Jack Russell slept most of the day as a devout vegetarian but at night, he transformed into the Werewolf and was sent into enemy territory on special missions. After being dropped into Uzbekistan, the Werewolf racked up 12 kills within his first month there while spreading fear, misinformation and panic among the locals. His reputation alone drove the enemy forces underground, preying off their superstitious ways. (Marvel Knights Millennial Visions 2001 - "Soldier by Day" - BTS) - Sgt. Philip Betbeze sent a memo to Major Todd Anderton evaluating the Werewolf's progress in Uzbekistan and requesting an air drop of hummus and pita bread for the vegetarian Jack Russell. The memo further noted that before a ground invasion of Iraq began, Sgt. Betbeze recommended recruitment of more "supernatural" soldiers and asked if contact had been made with Dr. Ted Salinger and Dr. Michael Morbius. Comments: Created by Bill Rosemann and Dan Fraga. Jack Russell's height and weight as the Werewolf on Earth-616 varied by transformation so it's safe to assume his height & weight on Earth-8648 did the same. Other supernatural characters mentioned in the story were Dr. Ted Salinger and Dr. Michael Morbius. One can assume that Dr. Ted Salinger was actually a reference to Ted Sallis, the Man-Thing of Earth-616 and Dr. Michael Morbius speaks for itself. It was unrevealed if the Werewolf had any prior contact with these characters. While Major Todd Anderton was also mentioned as a fellow officer that Sgt. Philip Betbeze wrote to, it was unrevealed if Werewolf had ever actually encountered either Betbeze or Anderton, though since Sgt. Betbeze evaluated Werewolf's progress, he did have some sort of affiliation with Jack Russell.